What my column will be about? I will dedicate it to all things audio. In our country the word "audiophile" received a negative connotation. If you are labeled this way it automatically confines you to being a member of some obscure minority group. I prefer to be called a "music fan", which still does not always help and occasionally the derogatory word "audiophile" is used against me. I am going to speak about audiophile gurus, the warming up of interconnecting cables and audiophilia as a phenomenon. To help us world famous experts will be engaged. Due to hot weather we will start a series of revelatory articles with a typical audiophile topic about a "warm lamp sound". I hope there is no argument about the meaning of the word "sound", but why it should be "warm" and created by lamps is not an easy question to answer. Bewilderment is also fuelled by hefty price tags attached to equipment used for the production of warm lamp sound. I do not pretend to be the judge of the last resort in this area, but I hope our readers will get some useful information from the article. First we should address the area directly connected with music, or to be more precise, its recording. The musicians know that with the help of different lamp add-ons you can have an interesting effect by overloading those lamps. At the final stage of recording lamps are unlikely to be used, because during the last 20 years this was carried out by heartless computers and bland stereo desks. Therefore, lamps are used while recording the music to add "nice" distortions. Please, remember it. The recorded music has to be reproduced somehow. We will ignore the issue of digital-to-analogue conversion, though some DACs (for example, MHDT Havana) use lamps at the output. 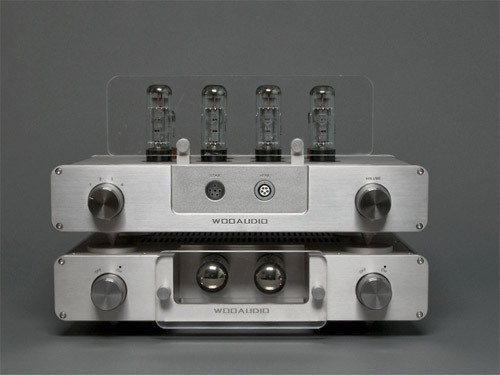 Look at amplifiers with shiny lamps. For example, Woo Audio WES for $5000. 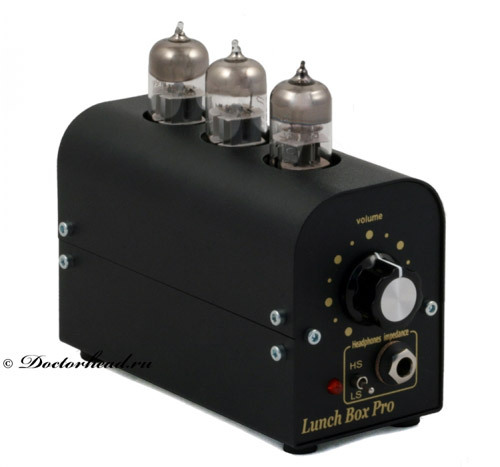 It is definitely an excellent amplifier. Many positive reviews prove it and I am not going to reveal any shocking truths, just look at the picture. It looks beautiful. Its jacks are made for equally expensive Stax and Sennheiser Orpheus headphones. This wonder of the engineering can be also complemented by the proper capacitors ($1280) and 50 year old lamps (4 items for $520 with a 1 year warranty). Why do we need it all and where can you find these wonderful lamps priced as a good mp3 player and offering a good sound? In the article about GAME card amplifier I wrote that the moves of music fans have no end in sight as the range of accessible, mid priced, expensive and overpriced components is extremely wide. I hope you follow my thoughts. It is a fact that the lamps add distortions and this effect is frequently used during the recording process. Similarly priced software and hardware solutions with transistors do not provide the same sound shades. Now let's connect everything we said. If the recording can already have warm and lamp sound why should we add extra distortions? At first sight it seems odd, because as we know audiophiles are always looking not for more distortions, but seek high fidelity, which gave birth to the famous hi-fi. But let's be honest – there cannot be so many different devices offering the best sound quality. We can argue about the meaning of the "best quality" and should differentiate it from excessive decorative effects. The key point here is emotional, because the lovingly selected pair of audio components must bring joy and good vibrations when you listen to your favorite music. If not to deal with the change of interconnecting cables, alterations of headphones and acoustic systems, correct phasing of the plug, capacitors of power supply – it is easier to change the amplifier or its components. You can also change the headphones or the acoustic system. Why should we do it if we like the sound in general, but we are tired of the current sound shades? To add new colors to life, so to say. Inquisitive readers may offer to use VST plug-ins to change the sound with the help of software solutions. It is not an option for those who do not want to use a computer as the primary sound source and still buy licensed CDs for their expensive audio players (for example, Accuphase DP-510 for $6000)? And after all a lamp is an analogue element, which is difficult and not useful to emulate with the help of software. Even if you are not ready to buy a quality sound source you can always connect an amplifier to a laptop or integrated sound card. You do not need special headphones – accessible Fischer Audio or Sennheiser models will do. It is actually a Russian device, which is quite popular abroad. Surely, all these amplifiers have sound distortions, but do not think about it now. Psychoacoustics creates new algorithms to hide artefacts in compressed music files. In other words the line between MP3 and CD recordings becomes more and more blurred. Numerous recordings which earlier were considered to be close to CD quality dos not sound well enough for modern ears and some codecs, for example AAC, make it more difficult for the majority of listeners to tell CD from MP3 during blind tests. Here the psychological factor comes into play. I read a lot and experienced myself that listening to MP3 is more tiresome than CD. But if you have only a couple of seconds for comparison the difference may not be so obvious. Can the same happen with the "cold transistor sound"? Why not? Adherents of digital sound claim that lamps "blur" the sound, which is difficult to argue as transistors work faster. The correct selection of an amplifier allows coloring the sound without losing the speed. Expensive devices have almost no traces of "slow" sound. I had an opportunity to compare lamp and transistor amplifiers from STAX. The lamp version is not so fast, but fast STAX headphones hide this low speed almost completely. That is why I have no prejudice towards the warm lamp sound. Every person chooses what s/he wants and the strategy can be different. We should not forget about the placebo effect as well. It is not difficult to believe in changes, especially if they are obvious only over a period of time. Sometimes it is more pleasant to see a carrot in front and slowly follow it than to be pushed by a soldier's boot in the right direction. The dream of the proper sound helps people to forget about everyday problems and live in the world of illusions. Almost all of us do it! I would like to add that I do not emphasize subtleties and things I am not sure about. I think what you hear straightaway is the most important. Details become obvious over long periods of time and influence the final assessment, but I do not want to risk and listen for the results of a warming up– the period of time between two listening is too big and you can easily make a mistake. So, do not worry – in my articles there will be no fine subtleties accessible only for the chosen ones. As to the warm lamp sound, it is not such a monster as it is described on different websites. You also should not judge all lamp devices on one amplifier created in the garage many a decade ago. The impression may be spoiled. It is a toy for those who know the purpose of the game. Finally, I would like to say that if you have any preferences as to the following articles feel free to send a message via my e-mail and Twitter mentioned below. I hope that this "live" format will make our communication more fruitful.